to implement by converting old reports and rolling out the new system to clients. After implementing Sisense, Brian was able to hit his primary goals of leveraging massive data sources - over 500gb of SQL server data - improving performance, and providing an updated look. Data is now flowing through the system much faster and our clients are getting paid sooner, which is the entire goal. Advocate’s old system had problems with speed and scalability. It could take multiple hours to produce an extract, often timing out during the process and failing. On top of this, it was very slow to refresh, was dated, and most importantly, could not handle their growing amounts of data. Brian worked heavily with Sisense’s professional services group and over the course of a year recreated, page by page, the previous environment within Sisense. Following the implementation of Sisense, Advocate’s user base was very excited. One user, responsible for entering charge information into the system, took the initiative to completely overhaul the dashboards and optimize them for their particular operations flow. While the bulk of Advocate’s usage is internal, they do have clients that request the ability to log in and get an overview of where their accounts are. This is where the granular security capability from Sisense really came in handy. Because security and privacy with medical billing records is vitally important, Brian loves how he is able to restrict clients from seeing each other’s data. Even internally, he can control which pages are available to which groups. Visual true style – used by the operations team internally for a very high-level view of business operations. 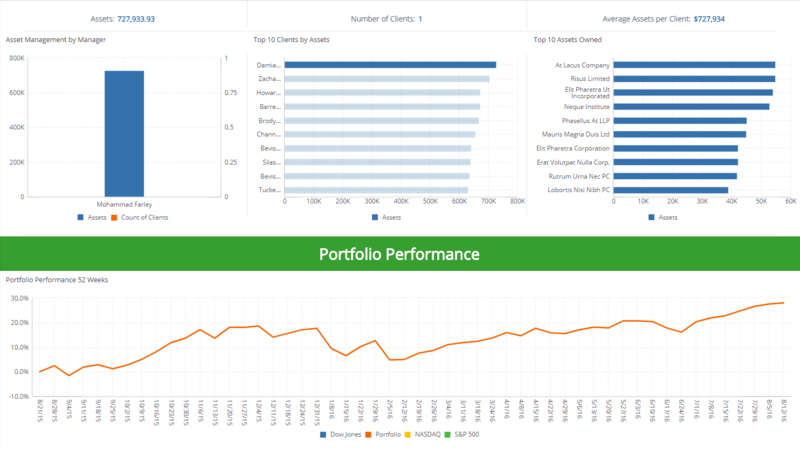 Question specific style – presents information on a specific business question, generally pie charts, a pivot table, and quick details on the financials. Advocate specific “Fusion” style – allows for extensive drill down and filtering for when clients don’t necessarily have a specific question and want to explore the data. In their old system, the “Fusion” style could only support up to two clients because of the volume of data and work involved. Currently, with Sisense, Brian has five clients making use of it and can easily scale far beyond as demand comes in. While overhauling dashboards, Advocate employees would often say “If I could just do ‘X’ it would save me hours a day.” This presented the opportunity for Brian to team up with other employees to build exactly what they needed. Now Advocate has a dashboard with red, green, yellow, and blue indicators to show how much of their workload needs attention. Upon implementing this they immediately saw a large percentage of their workload was in the red and needed immediate attention. With this visibility, it took just a couple of weeks to get caught up. Now there is very little workload that hits red. Advocate uses Sisense across their organization now. Management uses it to oversee their teams and get a high-level view of how big individuals workloads are. Frontline account processors use it to see which accounts need immediate attention. Client managers use it to pull monthly reports and financial information for their products. Brian even uses it to monitor his own BI team, including the state of the nightly data refresh, project lists, and even the state of Sisense itself.